If you’ve ever interviewed for a job, you’ve probably been asked to tell a little about yourself. This question will stump candidates and cause them to stumble if they’re not prepared for it. It’s a question that can make or break the interview for a candidate depending on how it’s handled. We’ve gathered our best advice from hundreds of interviews. Here are the insider tips from a seasoned Career Consultant. DO: Prepare an “elevator pitch”. I’m interested in pursuing this opportunity as a Director of Operations because my greatest strengths are organization, team management, and goal planning. As I read the job description, I felt passion for the words I was reading. My past experience in office management gave me the opportunity to create systems and manage other team members. In my current position as an Executive Assistant, I have enjoyed supporting my team and the executive. I want to continue my growth trajectory by becoming a Director of Operations in Real Estate. Above all, make sure that you do not ramble in this part of the interview. This is usually the first opportunity you will have to speak at length, and you want to make a great first impression. Interviewers are typically interviewing many candidates a day and will lose focus and patience quickly if you start rambling. DO: Keep it short and sweet. Again, you want to keep the attention of the interviewer during this question. Keeping your introduction short will prevent their mind from wandering and will make them want to pay attention to your answers. DON’T: Talk for more than 1-2 minutes. We’ve found that anything over a minute or two starts to lose impact on us. 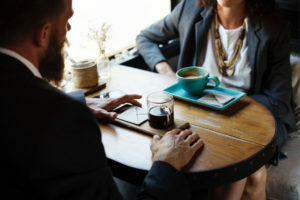 Watch for visual signs that the interviewer is wanting you to stop talking such as body language, verbal interjecting, or lack of note-taking. We’ve had candidates talk for 15 minutes without taking a breath – no, we’re not kidding. DO: Talk about your skills and strengths. The purpose of the interview is to learn about your strengths and skills! Make sure to incorporate them into your “elevator pitch” or introduction. You can weave them into your past and current experience by touching on what you have learned. DON’T: Tell the interviewer what skills are required for this position. The interviewer knows what is required to be successful in this role – they’re interviewing you for it! This should go without saying, but this is not the time to lecture them on the role. Avoid phrases such as, “Real estate is very fast paced and requires someone to react quickly” or “When doing social media marketing, it’s important to have a brand and theme”. DO: Make it applicable to the job for which you’re applying. When preparing for your interview, make sure that you tailor your introduction to the position for which you are applying. Look over the job description again and find keywords that stand out to you. Make sure you hit on the important skills listed in the ad if they are skills in which you have. DON’T: Tell the interviewer how the “job is done”. Again, the interviewer will likely know the job better than you do. They are looking for the particular skill set that they feel will be the most impactful in this position. How have you prepared for this question in the past? How did it go? We would love to hear your thoughts. Comment below with more ideas and ahas!